First of all, I’d like to thank the Daily Caller and Americans for Limited Government for red-baiting Camp Kinderland. For one, I’d be upset if they praised us. Also, it allows me to experience to a very limited degree the 1950s, in all of its McCarthyist glory, without having actually lived through it. Erica Groshen, Obama’s nominee for commissioner of the Bureau of Labor Statistics, evidently sent her children to Camp Kinderland. We should probably look at every educational institution any child of any nominee has attended to make sure we don’t turn any Communist into a government appointee. But since I don’t have time for that, let me tell you some of the things we do at camp that the ALG and Daily Caller would consider subversive. 1. We sing civil rights songs, which must sound like nails on a chalkboard to them. 2. We sing songs from other countries in languages that aren’t even American. 3. We learn about countries that aren’t even American. 4. We commemorate the Holocaust. 5. We commemorate the bombings of Hiroshima and Nagasaki. 6. We make really good friends. 7. We have socials where we dance. 8. We go swimming in the lake. 9. We make collages—and yes, we do make dreamcatchers and God’s eye. 10. We play soccer, though not very well. That is true. And the core values of Kinderland can be traced back to old roots. Principle One was Menschlichkeit—the Yiddish word for humaneness—that thrived in the caring for others among impoverished, oppressed Jews in Eastern European towns, and in the intellectual and industrial centers of Eastern Europe cities. Jews often participated in and often led intellectual and social movements for fairness and justice for all, which included a concern for life beyond one’s self and one’s group, and the commitment to end injustice and make a better life for all humankind. As campers, Erica Groshen’s kids would have lived in bunks named after people that lived by the principles of Menschlichkeit—Hannah Senesh, Harriet Tubman, Shalom Aleichem, Emma Lazarus, Woody Guthrie and others, Jews and non-Jews alike whose lives made a difference for other people. 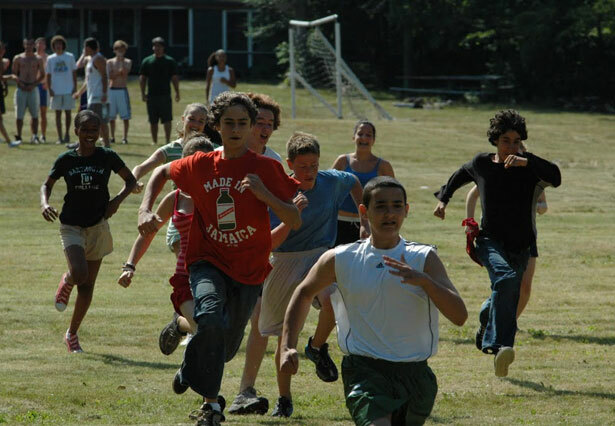 Unlike most other sleep-away camps, there are no color wars at Kinderland but rather the World Peace Olympics, where the cultural program, learning, and cooperation weave their way through athletics. And, oh, yes, the sports shack is named for Puerto Rican Roberto Clemente, for the major league outfielder who died in a plane crash on his way to Nicaragua to distribute food and supplies to earthquake victims. A parent visiting Kinderland would see kids singing songs about peace, civil rights, workers’ rights and love; dancing hip-hop and folk dances; debating about ecology, race, gender, law and more, both in history and the future. It is no surprise that Kinderland campers often apply their apply study and discussion to action, for that is what being a true human being, a mensch, means in the core tradition of the camp. The Kinderland I know and that Groshen and her children would have known is a place that welcomes all, and tries to make children nothing more—and nothing less— than the ideal at the heart of Menschlichkeit. As one counselor says at the end of my film: “We’re trying to teach people how to be a mensch.” That’s the story that the Daily Caller should be writing, but to say that Erica Groshen sent her kids to a camp with humanitarian roots would not make a headline. Katie HalperTwitterKatie Halper is a comic, writer, blogger, satirist and filmmaker based in New York and the host of The Katie Halper Show on WBAI.